Don’t blow your diet this Christmas! Whatever you eat keto, low carb, paleo or vegan those coconut flour cookies no sugar (yes, they are 100% sugar free ) are the healthy Christmas cookies you need to makes everyone happy. You won’t miss your classic shortbread cookies, those have the exact same texture – they melt in your mouth with a heavenly buttery vanilla flavor – without the carbs, butter or sugar. I am so ready for the Christmas cookie season. I know, it is super early but with all the Christmas decoration already in store I can’t stop thinking about Christmas cookies. Also I am French, and one of the French Christmas tradition is to bake a cookie everyday during the month of December. Well, I did not really stick to the tradition the past years. But still, Christmas means cookies for me. So back to those shortbread coconut flour cookies with no sugar. I won’t lie to you, I tested this recipe 4 times before it really turns out great. 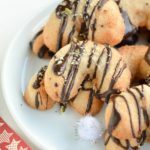 Yep, it was a challenge to create a low carb cookie recipe without eggs – you know I made the vegan choice 6 months ago, right? Removing eggs from a cookie recipe is usually easy peasy but when you are using crumbly coconut flour it makes things more challenging. Anyway, here we are I made those delicious coconut flour cookies no sugar added and they are BOMB! I really wanted to use coconut flour because it adds so much goods protein and fiber to baked goods. I have been a huge cookie eater in the past, I could easily eat 10 shortbread cookies at once! Now, my technique to control my sweet cravings and keep my weight in control, is to create cookies with no sugar, good fat and healthy low carbs flours rich in protein and fiber. Coconut flour is one of my favorite flour to bake low carb recipes and I make everything with it from sugar free coconut flour brownie to coconut flour pie crust. Trust me, even if those coconut flour cookies are very delicious you won’t eat more than 2 or 3. They are very fulfilling and won’t blow your carb count as well. They are buttery like a real shortbread and the sweetness is just perfect. Erythritol, or any sugar free crystal sweetener you love. Some people don’t like the fresh taste of erythritol, I guess I am used to it after 4 years eating sugar free. Others alternatives are monk fruit sugar or swerve in US. I made them 4 times so I learnt a lot during the process of making those coconut flour cookies. Those are my tips to make those cookies great everytime. 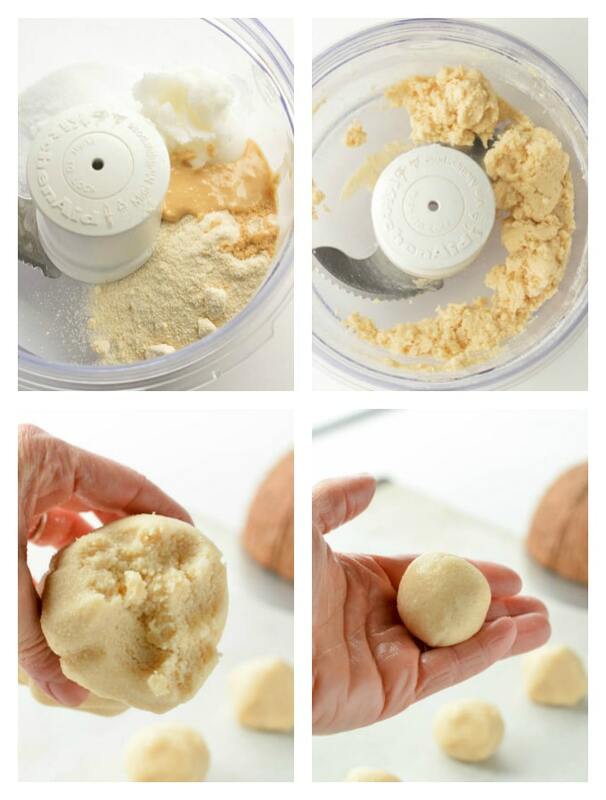 The dough can be made in a food processor, with an electric beater or your hands! I tested all options. I found it messy to make the dough with my hands so I prefer to use my food processor or to beat the ingredients with my electric mixer first, it forms a crumb in like 20 seconds, and then I use my hands to gather pieces into a dough ball. The dough is crumbly, that is normal, that is what you want to make a delicious shortbread cookie recipe. It needs a bit of work to gather the crumb into a dough ball – took me about 1 minute. The more you knead the more the coconut oil soften/stick to the flour and makes that dough ball comes to life. 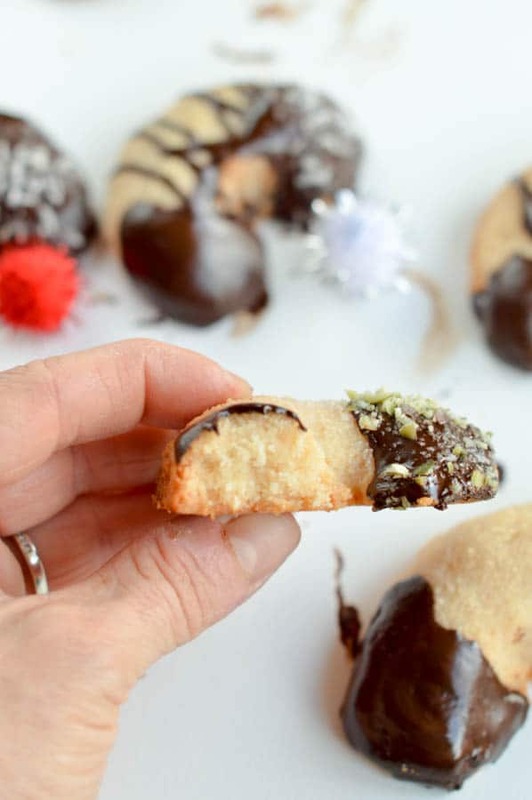 Wrap the crumbs into a plastic wrap, press firmly, it helps the cookie dough ball to form. Don’t skip the 10 minutes in the fridge, the dough needs to firm up before you roll cookie! 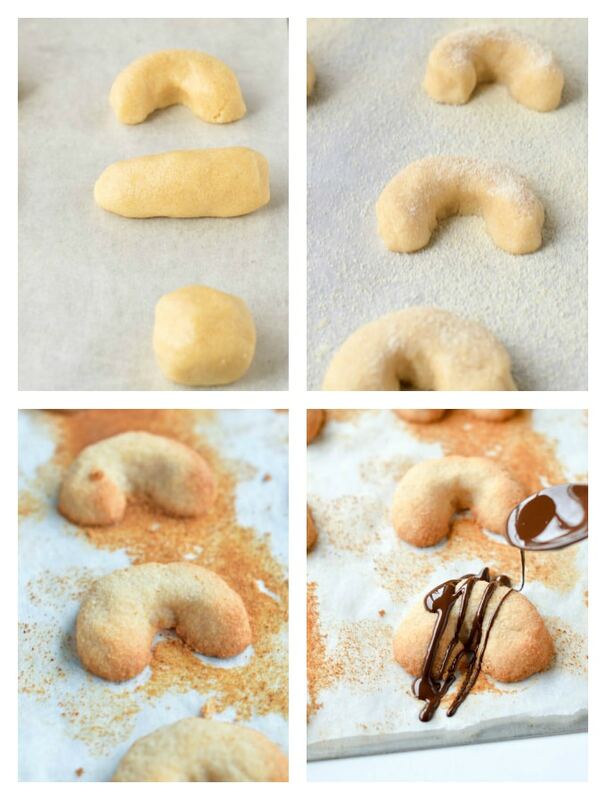 The crescent shapes are cute but not the easiest to make – dough is dry/crumbly. Make it simple form 12 cookie balls and press them with the back of a fork to flatten 🙂 Much faster and super cute too. Don’t touch the cookies when out of the oven, they will be super fragile/soft. They must cool down fully on the cooking tray to gets hard and crunchy. I hope you enjoy this recipe. Now I have to go for a run because I had too much cookies this morning. hahah foodblogger life is hard right ? 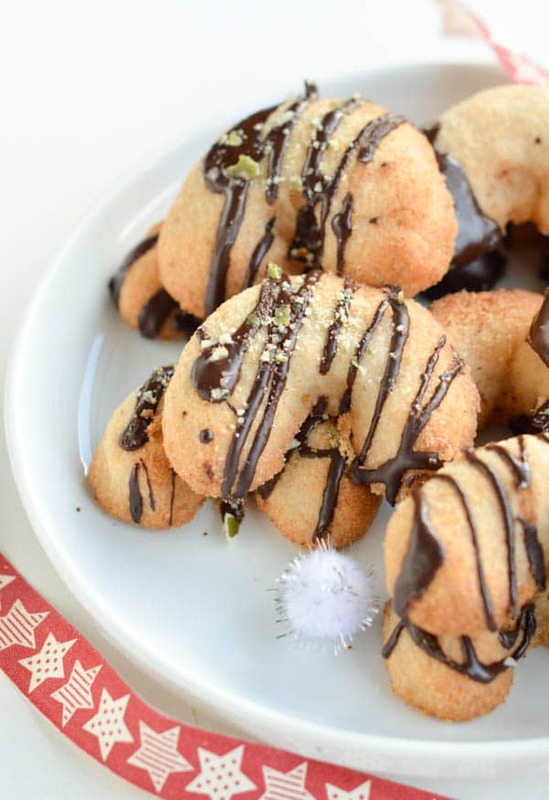 Watch the recipe video and make those delicious coconut cookies now ! Preheat oven to fan-bake 180C (350F). Prepare a cookie tray, covered with parchment paper. Set aside. Place all the ingredients in a bowl, beat with an electric beater until it form a crumble. It should not take more than 20 seconds. If you don't have an electric beater you can also press/rub the dough with your hands until it forms a crumb - just a bit more messy! Assemble the crumb with your hands to form a cookie dough ball and transfer the ball onto a piece of plastic wrap. It is a crumbly dough, that is normal, press firmly with your hands to gather the pieces together and firmly wrap the batter to form a ball. If it really doesn't come together after you knead the dough for 1 minutes add slightly more coconut oil - up to 1 tablespoon max. Refrigerate for 15 minutes to firm up. Remove from the fridge, open the plastic wrap, the dough will be firm but still crumbly when you take some in your hands that is ok. The more you knead the dough the easier it become to form balls as the coconut oil soften. Roll 1 tablespoon of dough into a ball, pressing the dough firmly in your hands. Place the balls onto the prepared baking sheet. If you want to make crescent shapes cookies, first shape the ball into a cylinder, slightly pinch the middle to form a crescent shape. The fastest will be to simply flatten the ball with a fork to form lovely round shortbread cookies. Repeat with remaining dough until you form 12 cookies. If you like, sprinkle extra coconut flour on top of the cookies before baking. Bake until light golden brown on the sides 6 to 8 minutes. The cookies will stay very soft at this stage and that is normal, don't touch them or don't try to remove them from the tray, they firm up when fully cool down. Cool down on the baking sheet for about 30 minutes until it reach room temperature. 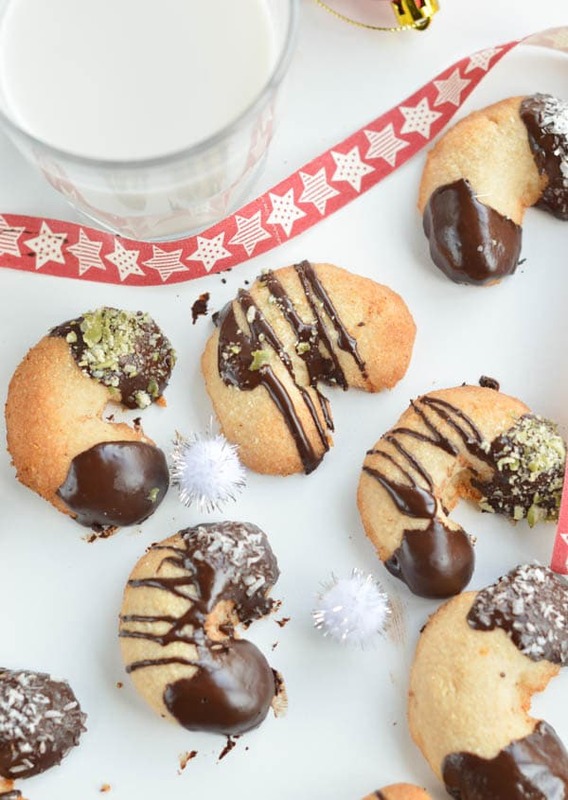 As it cool down the coconut oil harden and create crispy crumbly shortbread cookies. I usually place my baking sheet outside in summer to cool down in fresh air quickly or near an opened window. Decorate with a drizzle of melted sugar free chocolate if you like. I used dark chocolate sweetened with stevia. Storage: store in a cookie jar for up to 10 days. Sugar free Sweetener: I used erythritol in New Zealand I am buying Natvia. If you are based in US I recommend Swerve crystal sweetener or monk fruit sugar. Non sugar free sweetener/healthy: if you tolerate sugar but want to make this recipe with healthier sugar alternative use coconut sugar or unrefined cane sugar of your choice. Dry dough after it stays in the fridge? Simply knead the cookie balls a bit longer, they will warm up in your hands and soften the coconut oil to form perfect cookie balls. Nutrition panel is for one cookie using cashew butter and including the toppings. This recipe makes 12 coconut flour cookies no sugar. I can’t wait to hear back from you ! Enjoy the cookies. xoxo Carine. I made the cookies used butter instead of coconut since I didn’t have any. The taste was good but they kind of fell apart. Hi ! That is what I said in the recipe, they firm up when cooling down and that is why I recommend using coconut oil. That is the trick ! Butter won’t firm up at room temperature leaving the cookies soft and crumbly. Enjoy the cookies and thanks for trying the recipe on the blog. XOXO Carine. Bonjour Carine! I follow you from France and I want to tell how much I love reading your blog. I am type 1 diabetic and I already made a batch of those cookies this morning. I was so excited to see a sugar free cookie recipe with low carb flour! I just want to say that it works very well, the dough was a bit crumbly as you said, so I did not make crescent shapes cookies, simply circle cookies as you recommended. The taste is the same as a French sable cookie ! Merci beaucoup for this recipe ! Wow! That was fast Chantal 🙂 I am SO happy you enjoyed the cookie recipe. My mum is type 1 as well and she lives in France too so I am glad to hear the recipe works everywhere in the world. Enjoy the low carb recipes on the blog. Merci ! Carine. Can another oil or shortening be used instead of the coconut oil? Hi, I am not sure as I only made the recipe with coconut oil. Maybe butter could work but it won’t be vegan anymore. Coconut oil works really well as it gets harder when cold. So when you place the cookie dough in the fridge before baking, it really hold well together. Enjoy the recipe ! xoxo Carine. Thanks for your lovely comment! I am so happy it turns out greeat. XOXO Carine. Have anyone tried adding xantham gum to this recipe to get dough a little more stickier? Thanks for your lovely comment! I love to read that. 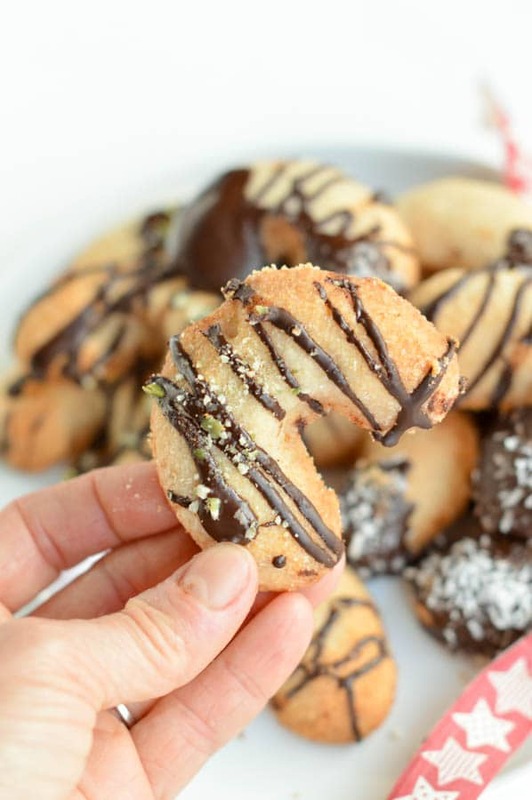 I did those cookies many times before sharing the recipe, as for all my recipes I like to share easy and tasty recipes that works for everyone. Thanks for trying them from your kitchen and sharing your lovely feedback here. XOXO Carine. No sorry, stevia won’t add any texture to those cookies and they will fall appart. Go for erythritol or coconut sugar, it will melt perfectly in those cookies, don’t worry! XOXO Carine. I’m looking forward to trying this. Is there a substitute for nut butter? Psyllium husk, almond flour? Only cos I’m trying to use up the coconut flour and other ingredients I have and not buy more stuff. Thanks. I would rather recommend an egg (if you are not vegan), other flour/meal will dry up the batter and won’t make great cookies I think. Let me know if you are trying something new! I am happy to hear your own recipe 🙂 Have a great day and thanks for reading the blog, XOXO Carine. Can you put this mixture in a cookie press? It is a friable cookie batter so I would not recommend a press or cookie cutter. Enjoy the recipe ! XOXO Carine. Hi …i tried this recipe today and followed it exactly . Amazing taste . But it spread too thin while baking and did not harden as expected after cooling it for over an hour . Any thoughts on as to why it did that? Hi! Did you replace any ingredients in the recipe ? I highly recommend solid coconut oil if it is too soft or liquid the dough will be super crumbly. You can replace cashew butter by an egg if you are not vegan. It will perfectly hold. Let me know. Thanks for the lovely comment. XOXO Carine. I am SO happy to read your comment! Enjoy the sugar free recipes on the blog. XOXO Carine. Hi Carine, I was excited to find your recipe to have some cookies I can eat on a temporary restrictive diet to improve “gut” health. Thanks! I followed the recipe, but the balls never flatten. They are tasty, but the consistency is more powdery. My convection oven converted the 350F to 300. After 8 minutes they weren’t browned so I increased it to 325 for 5 minutes and they browned but remained as balls. I used 3 tbsp of Wholesome Organic Stevia, blend of organic eryhritol and stevia. Used crunchy almond butter. Should the dough balls have flattened? What temperature did you use with your forced air oven? Can you double the recipe to make more cookies? Would the eggs have helped reduce the powdery consistency? Hi Larry! This cookie dough doesn’t flatten, it stay in the shape you choose to shape them. Temperature must be 350F on convection oven (that is what I called fan forced in my instructions), 300F will under cook the cookie for sure. 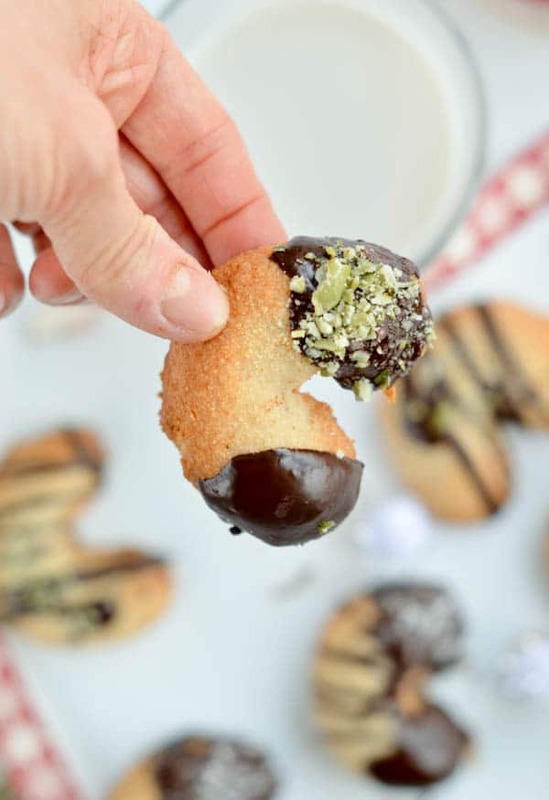 The egg definitely helps with the consistency but if you eat sugar free and want a crunchy cookie with less shortbread texture I recommend you try my almond flour cookies. Those are not powdery at all and makes larger cookies. That’s the coconut flour in this recipe that makes powdery consistency. Enjoy the recipes and thanks for giving them a try. XOXO Carine. I tried following your recipe but the dough had no shape and was wet, making it impossible to form balls. I tried to refrigerate it longer but it’s still the same. It looks like your dough was too wet. Did you use any different ingredient? The trick to this egg free shortbread recipe is to use solid coconut oil won’t work if melted. Let me know ! XOXO Carine. Can maple syrup or honey be used for the sweetener? No, you must use a crystal sweetener or the cookies will be too soft. Try any unrefined cane sugar for an healthy vegan option Enjoy XOXO Carine. Can Xylitol be used for the sweetener? Yes sure! Any sugar free crystal sweetener works use the one that you prefer. XOXO Carine. Awesome news! Enjoy them. XOXO Carine. Hi I am wondering how you get your coconut oil to be the perfectly solid the way you need it for this recipe included the summer? In the summer my coconut oil is completely melted at room temperature. Cookies look lovely, will try soon. Thank you. Hello! In summer I store my coconut oil in the garage or in the fridge! It is the best way to keep yours solid. I hope this helps you make the coconut flour cookies. Enjoy, XOXO Carine. Needed to write a comment to tell how good they are ! Really easy to make and wonderful to eat ! I follow a ketogenic diet and my girlfriend has allergy to almonds so coconut flour is the only alternative. I added a few cinnamon in the mix and once cooked and cooled down i coated them in a homemade dark chocolate, taste like magic ! YEAH! thanks for the lovely comment. Merry Keto Christmas to you. XOXO Carine. Hi, I can’t see the nutrician information? The nutrition panel is after the recipe box, simply scroll down and you will see it ! Enjoy the cookie recipe. XOXO Carine. Hi! I made this cookies yesterday and they are really dry. I did everything by the recipe, except I substituted cashew butter for peanut butter and I baked them a few minutes more because they were not golden brown yet. Any idea why they are so dry? Is there I way I do something (now after baking) to make them a little bit drier? Thanks! The cookies have a great taste, & I followed the recipe to the letter. My problem is that they have a gritty texture. Did I do something wrong? Thanks for the lovey comment! You did not do anything wrong, coconut flour is always giving a gritty texture in baking but it is such a great low carb flour if you are on low sugar diet. Some people don’t feel it much some does, I hope you still enjoyed that recipe. XOXO Carine.